I first became aware of the delightful scent of linden blossom some years ago. I was having a lovely stroll in a nearby park, and as I meandered under the cover of some stately trees, a fresh and sweetly honeyed-green fragrance surrounded me, blending with the dappled late afternoon sunlight and the grounding scent of warm scuffed earth and stone. I later discovered that this was the well known linden blossom, lime blossom, or tilleul. It fast became a favorite of mine, particularly in home fragrances and body products. Quietly refreshing, its limber green structure is interwoven with a hint of tang and a gentle airy sweetness. In home fragrances in particular, I find it has a charm that is both elegant and fresh. One of my all-time favorite linden body products is the Roger & Gallet Linden Blossom Moisturizing Shower Cream. Part of their Gentle Nature collection, this shower cream is enriched with shea milk, and forms a heavenly silky-sudsy foam that fills the shower with the sweet scent of fresh linden blossom smoothed with creamy honeyed tones. It's fairly moisturizing, and lingers gently on the skin for quite some time. I was surprised that the scent of the shower cream alone was strong enough to hold its own against lighter perfumes. I had what I thought was the brilliant idea of layering it with Hermès Hiris, but they could not abide each other, so be warned. It did do somewhat better with Frederic Malle En Passant. For more intentional layering, it might be a compliment to Jo Malone's French Lime Blossom or perhaps a more nuanced fragrance such as L'Artisan La Chasse Au Papillons where it might enhance the linden note. Please do comment if you have tried these or any other combinations! A few more thoughts on linden: L'Artisan Parfumeur does a gorgeous linden for the house in their Tilleuls au Vent scented candle (see Robin's review of the room spray). I can't recall the scent entirely, but I do remember comparing it unlit directly to a linden flower with very little difference. Manuel Canovas does a nice home spray, of which I have only tried a sample, called Fleur de Coton. It's a bit more powdery than I prefer, but very nice nonetheless. Fresh makes one of their big fun triple milled soaps in Linden, which has a fresh green and slightly floral scent, vaguely reminiscent of linden but less true to the original flower than I find the others to be. Roger & Gallet Linden Moisturizing Shower Cream is $16 for 8.4 oz at beautyexclusive. 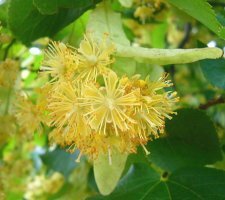 Note: image of Tilia (linden) blossom by Magnus Manske via Wikimedia. Oooh, I'll have to look for that wash. I fell in love with Linden when I found a body splash by a company called Formula f21C that was at Nieman Marcus. It is so…. hot summer day smelling. More earthy than most florals. I find Linden things here and there, including tea, but I will definitely look for this wash. Hopefully there is lotion? I am a “lotion whore” as one of my friends called me. Linden is so beautiful but so often in the US it's paired with white florals that make it too sweet and, well, FLORAL, when I think it smells best when its herbal side is emphasized. Interestingly, while there aren't that many popular linden fragrances in the US, in continental Europe it's a pretty popular “generic” scent, much like vanilla is the popular “generic” scent here. When I went to Amsterdam they had generic-brand linden bodywash and soap all over the place for 3 euros. I bought so much back home. BTW I think Linden is generic here in France because everyone is familiar with the scent, “Tilleul” is just everywhere and is highly esteemed as a Tisane. Personally I prefer breakfast tea but then I am English. The scent is so good however that I inhale until my lungs are bursting. Can’t get enough. Just wish the flowering season went on longer. Off to seek out another flowering tree; horse chestnut. It’s up there with Linden, sweeter though. Sorry, I brought* so much back home. It's very hard to BUY linden stuff in the US that isn't at an unreasonable price, like that Roger & Gallet's stuff. Ooo, that body splash sounds mighty tempting. Wonder if it is still around? Will have to check…. There is indeed a lotion! There is also a bar soap. I haven't tried it in Linden, but the R&G soap in Green Tea is my favorite green tea scented product. I think Beauty Exclusive carries them all…. It's true, come to think of it, I definitely associate linden as a European scent, rather than American. I think of it as something one might come across regularly in the pharmacies over there , as opposed to only high-end beauty counters. I haven't tried a linden scent where the herbal side was emphasized…that sounds intriguing. Hopefully linden as a whole will catch on this side of the pond as well (or the dollar will go back up)! I will definitely try that wash. I'm a huge fan of Linden, have been for many years. I like Jo Malone's French Lime Blossom but am always looking for another fragrance that does Linden justice. I've found a nice, rather inexpensive line, called Provence Sante, that carries a Tilleul fragrance and it's very nice. Does anyone know of other Linden fragrances? I mean Linden as the main act – not simply among the listed notes covered by other white florals… I think what another comment above suggests….Linden with other more herbal notes would be dreamy… thanks! I can confirm that. A lot of reasonably priced toiletries, scented with tilleul, can be found in French supermarkets (Monoprix, Carrefour, etc.). Tilleul is my favourite 'tisane' (herb tea). I'm never without a couple of boxes of it in my cupboard. I like it with verbena too (Tilleul-Verveine'; you can get mixed sachets in France). It's lovely and calming. And it doesn't taste of grass. I was under the impression that I didn't like linden, because I'd tried it a number of times mixed with white flowers and found it off-putting. I guess it was a as-yet unsleuthed white flower that I was not enjoying, because I recently smelled a number of linden products and really liked them. Diptyque has a really gorgeous (but not cheap) room spray in Tilleul. Yet another reason to go to France (as if another one was needed)! I would also love to hear of other linden fragrances. I wasn't crazy about the Jo Malone when I tried it–but I may need to revisit it. Will have to explore Provence Sante! Hope you love the wash! Ha! I love the infusion, too. Although it's sweat-inducing. My mom used to give it to us when we had a cold before going to bed, so we would sweat out the illness. In Turkey it's one of the most common flavors for drinks. They even have linden granules for making instant drinks. Sweat inducing? That's good to know! I would love to try a linden flavored drink–again, does it taste the way the blossom smells? That also reminds me of elderflower syrup…that's a common flavor for drinks in Denmark. It's very refreshing when sweetened and mixed with sparkling water and lemon! Hope you like the wash as well! Were any of the ones you smelled available online? Oh no! Not another diptyque to fall in love with….a girl only has so much room in her heart, er, wallet! Oh, I didn't know that. It doesn't have that effect on me at all. I just find it very fragrant and relaxing. True, it doesn't really smell/taste like the flower. It's very mild. Verbena gives it an extra little twist. It also reinforces the calming effect. They go very well together. I will definitely look for it next time I am at the supermarket. We have a local chain that carries a lot of imported tisanes/teas. Right now, I am also enjoying the abundance of lemon balm in my garden and making evening tisanes out of that. D'Orsay Tilleul is lovely — I think it's relatively true to the flower and has that kind of funky hay note that I think people either love or hate. I also think Bond Eau de Noho has linden in it, but it's set within other florals (violet?) Also, I thought Pre de Provence did a cheap, nice eau de toilette, but I can't find it online, so perhaps I'm thinking of the Provence Sante. I did a little research and I think that the company evolved (or devolved, however you want to think about it) into Fresh. They make a Formula f21c skin wash that has Linden in it, and a Linden soap. I also saw an old review of some other linden stuff I had – a Linden Honey body wash that was made by Fresh. Thanks for the info! I've tried the Fresh Linden soap–it's nice, but not love. Will keep an eye out for that skinwash though, and honey sounds nice too! I will have to try out D'Orsay Tilleul. So far I've enjoyed linden more in the home/body product area than in perfumes, but true to flower and funky hay note sounds like it could be the 'one'! Hi – I'm new here, just saying I have enjoyed your blog a lot. Thanks for the great articles. You have a way with words!! I swear, I just can't break down notes in perfumes at all. I know what I like and what I don't, and that's it. Maybe I'll learn a thing or two here. Hi Elizabeth and welcome! This is Robin's blog, not mine, lol, but I'm glad you enjoy it–I do too! I am sure you will indeed learn a lot about perfumes from her and the others if you continue reading! Be warned though, it can be addictive! I live on a street lined by linden trees on both sides. Imagine my excitement when I discovered they were linden trees, but the bloom never carried a scent, and they are white, not yellow like in the picture. They bloom early in the summer, so there's no heat to carry the fragrance, if any. The only thing attracted to these trees are Japanese beetles. I wonder if there's an American linden variety that is scent-less. Jo Malone's French Lime Blossom does a good job, and there's also a nice soap made by Provence Sante called Tilleul. How sad that you cannot smell your lindens. My neighborhood in Baltimore is full of linden trees and they have just now started to bloom. The smell is heavenly! I love Roger & Gallet's Linden scent, and have worn it in combo with Jo Malone's new Lotus/Water lilly scent they are fabulous worn together. Yes, Third Shift, we have to find you some lindens that you can smell! Oh YES, that sounds like a smashing combo! Just the thing….thanks! Trish McEvoy #8 Citrus Petals has linden blossoms, and it quite lovely. It has a little more musk than I prefer, but I really enjoy wearing it at the end of winter just before spring, when I want something fresh but still warm. for the record, Provence Sante isn't anything fabulous, but it works when you're craving a decent Linden fragrance…and there are so few. And, best of all, it's between $20-30 retail for a 100ML bottle. If you hate it – you could use it as home spray! Thanks Abigail. That price range is very reassuring, and for dual-use no less! You should take a sniff it is really pretty, and has fairly good lasting power. And perhaps review some other Trish McEvoy fragrances. I'm not a fan of her entire line, but there are a few pretty ones, and she's trying to be a little different from the regular blah stuff that's being put out there. It's also nice because she sells a smaller bottle of all her fragrances, so you don't have to buy an entire large size one…. I should revisit her fragrances. I almost purchased one called, I think, Mandarin and Ginger Lily for a young friend of mine (teens), and I briefly wore her Snowdrops & Crystal Flowers fragrance some years ago…they do seem to be quite nice quality, and a little different–a bit fresh and modern and not too self-important! I will try and find some samples and give them more considered attention. In nature this is by far my number one favourite scent. Luckily for me I have a Linden tree in my garden and when it flowers in early summer I am in Heaven for a brief while. I must take notes from this thread and track down some samples. Lucky you! Linden blossom is just lovely….we have a few trees outside my apt in NYC and I was shamelessly inhaling them to the amusement of my neighbors. It is too bad it’s just a brief period each summer that they bloom!